View cart “DİLAY : 24K- Plated + Sting Ray Barb” has been added to your cart. Bouncing teardrops dazzle with sparkling facets and celestial orbs. This playful and sensual adornment is meant for enticing. PLEASE NOTE: This piece is specially made for you. Please allow 2-weeks for delivery. 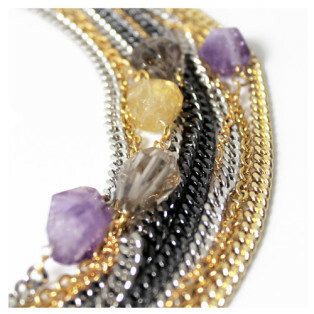 Steaming strands of gilded Chezs fashion a waterfall with faceted gemstones and antique coins. A streaming strand of gilded facets serenade folktales of Spring. This adornment is feminine and strong, powerful and delicate. Wear with your favorite plunging top, casual or dressy. Falls softly on the body like fabric. PRE-ORDER: This piece is specially made for you. Please allow 2-weeks for delivery. She fills us with suspense wondering what lies underneath. Droplets of gilded Chezs fashion a dreamy path with moon dusted gemstones and antique coins. PRE-ORDER: This piece is specially made for you. Please allow 2-weeks for delivery. Steaming facets dotted with Herkimer Diamonds and Onyx encircle porcupine quills. A bohemian jewelry lover's dream. Gilded strands, dotted with cosmic dust and golden dipped plumes conjure a lovers tale - the sweetest taboo. PRE-ORDER: This piece is specially made for you. Please allow 2-weeks for delivery.